The recipe comes from our returning guest on The Faith Middleton Food Schmooze®, Lucinda Scala Quinn, executive food editor of Martha Stewart Living. Her new cookbook, Mad Hungry Cravings, is based on the idea that we should make what we crave and dive in with gusto, instead of thinking it will take forever, or it's easier to just order in. She says, go ahead, order a pizza, and while it's being made and delivered, open a can of tomatoes for tomato soup, and make a hearty grilled cheese sandwich. Lucinda bets you'll be done before the pizza arrives, and our soup and sandwich will taste just as good and will be healthier. Not a bad idea for those of us who went calorie-wild through the food-centric holidays. (Much as I tried, I couldn't resist a big box of buttery homemade cookies, a case of champagne, and salty-sweet granola, among many other food gifts.) Steamed salmon sounds just about right. Preheat oven to 375°F with a rack in the upper third position. Season the salmon with the salt and white pepper. Place on a large piece of foil and close to make a loose-fitting, tightly sealed package. Put the salmon on a baking sheet and cook for 20 to 25 minutes, until the fish is still slightly rare in the center (it should be only slightly resistant to the touch). Carefully open the foil and let the fish rest for a few minutes. Or let cook completely and chill before serving. Meanwhile, combine the mayonnaise, lemon zest and juice, scallion, caper, dill, and parsley. Season to taste with salt. 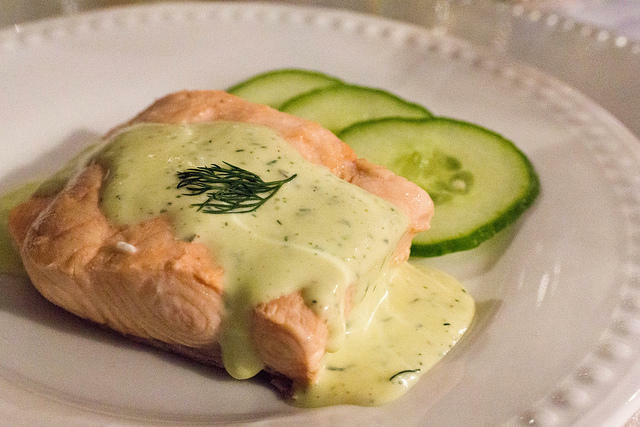 Cut the fish into 4 pieces and serve with a dollop sauce on the side. Recipe from Mad Hungry Cravings by Lucinda Scala Quinn, published by Artisan 2013. Place 2/3 cup of water, a pinch of salt, and 3 tablespoons of steel-cut oats in a 1-quart bowl. Microwave for 1½ minutes. Before serving, microwave at 50 percent power for 5 minutes. Recipe from Anna Smith, published by Fine Cooking Magazine. Chris Prosperi is senior contributor and chef/owner, Metro Bis, Simsbury, CT.
Lucinda Scala Quinn is author of Mad Hungry Cravings. Oysters have been part of the human diet for thousands of years. It’s no wonder then that many of us know them as a favored menu item. But these beloved bivalves have a history that extends far beyond the dinner plate. In 2030 B.C., somebody brought cucumbers from India to the Tigris Valley, and they said, "We can pickle that!" And so it began, from the first stirrings of civilization, to modern-day Brooklyn artisan pickles: we've found ourselves up to our eyes in brine, looking for the next object we can pickle.